‘ATTACK OF THE GREY LANTERN’ TO BE PLAYED IN FULL ON NEXT TOUR! 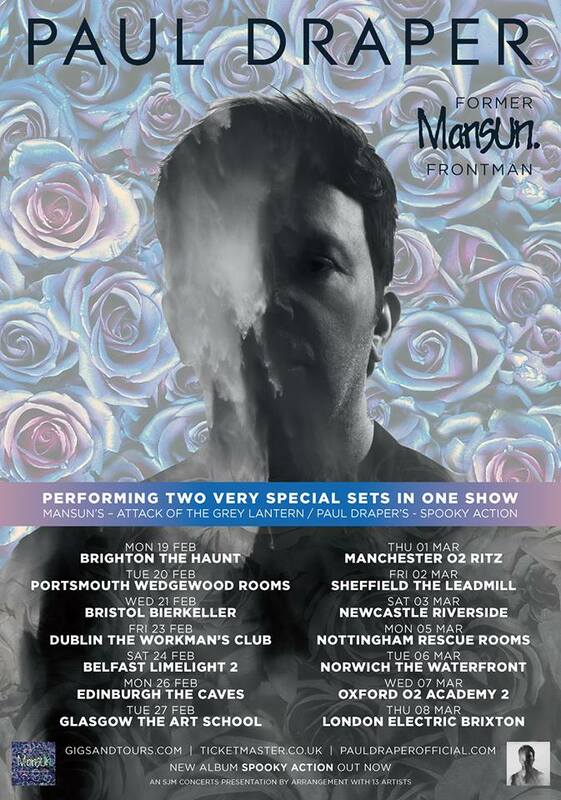 Former Mansun frontman, Paul Draper, has announced that he will play Mansun’s chart topping album, ‘Attack Of The Grey Lantern‘ in full on his February / March tour, IN ADDITION to playing a full set from his solo album ‘Spooky Action‘. “I will play Attack Of The Grey Lantern in full, live on every date of the Feb/March 2018 UK tour. I will be performing 2 sets, opening with Spooky Action & solo material then, after a short intermission, will play AOTGL in full, to celebrate its 21st Anniversary. This will tie in with other important announcements to be made about the anniversary of the record over the coming months. Demand for this 14 date tour will be heavy, so secure your tickets NOW before they sell out!